Hours after Pearl Harbor on December 7, 1941, the Secret Service found themselves in a bind. President Franklin D Roosevelt was to give his infamy speech to Congress the next day, and although the trip from the White House to Capitol Hill was short, agents weren’t sure how to transport him safely. The White House did already have a specially built limousine for the president that he regularly used, it wasn’t bulletproof, and the Secret Service realized this could be a major problem now that the country was at war. FDR’s speech was to take place at noon December 8th, and time was running out. They had to procure an armored car, and fast. There was one slight problem. US government rules at the time restricted the purchase of any vehicle that cost more than $750 ($10,455 in today’s dollars). It was pretty obvious that they weren’t going to get an armored car that cheap, and certainly not in less than a day. One Secret Service agent was a quick thinker. The federal government did already have in its possession a car that just might fit the bill: Al Capone’s, which had been sitting in a Treasury Department parking lot ever since it had been seized from the infamous mobster during the IRS’ tax evasion suit years earlier. Capone’s car was a sight to behold. It had been painted black and green so as to look identical to Chicago’s police cars at the time. It also had a specially installed siren and flashing lights hidden behind the grille, along with a police scanner radio. 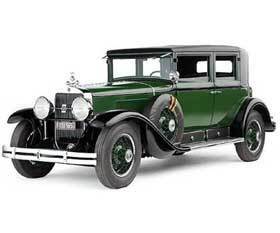 To top it off, the gangster’s 1928 Cadillac 341A Town Sedan had 3,000 pounds of armor and inch-thick bulletproof windows. Mechanics are said to have cleaned and checked each feature of the Caddy well into the night of December 7th, to make sure that it would run properly the next day for the Commander in Chief.